Now as I was having a rather relaxing Australia Day, I didn't feel like making one type of potato so I tried making the stacks three ways. So this recipe is for the potato stack on the right. These were delicious, it is probably the best way to bake potatoes. You get individual portions, they are simple to make and they look amazing. And most importantly they tasted great. But, they didn't go with lamb. These cheesy potato stacks I would serve with chicken. Chicken I feel is lighter in flavour so the richness of these potatoes would work perfectly together with chicken. So please do make them, as they are delicious, but they would taste perfect with chicken, not lamb or beef. Also this is a recipe where the recipe is a guide really. You can make more or less of them, without worrying about measuring anything, as basically the recipe is, you fill up a muffin hole with potato slices and add a teaspoon of cream mixture and some cheese to each stack. Use cooking spray to lightly grease a 12 hole, non stick muffin tin. In a medium bowl place the melted butter, garlic, cream, salt and pepper, stir to combine. Place the potato slices evenly into the 12 holes of the muffin tin, the potatoes need to go halfway up the muffin tin holes. 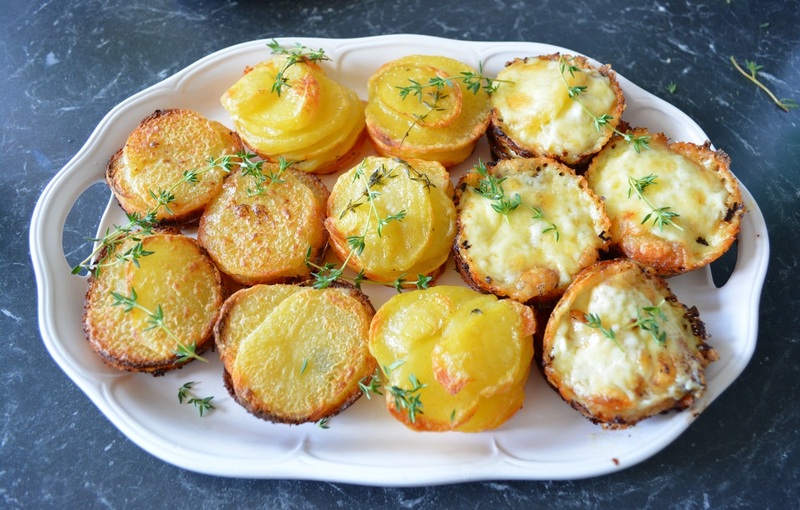 Drizzle each potato stack with 1/2 teaspoon of the cream mixture, sprinkle with half of the thyme, then sprinkle with half of the tasty cheese. Top with the remaining potato slices. Drizzle with the remaining cream mixture and the remaining thyme. Place a sheet of baking paper over the muffin tin, to stop any potato sticking to the aluminium foil. Now cover with aluminium foil. Bake for 35-45 minutes. You want the potatoes nearly cooked at this stage, poke with a cake skewer to check. Remove from the oven, sprinkle with the remaining cheese, bake uncovered for a further 10-15 minutes or until golden and the potato is completely cooked. Allow to stand for 5 minutes before removing. I used a dinner or butter knife to help ease them out.